The plant is known as the "corpse flower" because it stinks of rotting flesh. The biggest-ever Titan Arum in captivity flowered in New Hampshire, USA, and reached a height of 3.1 metres (10 ft 2 ins). I had watched a documents about this strange flower. They mentioned that there is a "logic" behind this stench. Since this is a lonely flower in a jungle, it has to attract its pollinators from far away places. As result God has designed it in such a way that the "smell" reaches to far away places...just to tell the pollinators: "I am here"
Every bloom has a different audience for its pollination , Corpse flower stenches because its pollinators are carcass-eating insects. Every bloom has a different audience for its pollination :-), Corpse flower stenches because its pollinators are carcass-eating insects. Lets change the topic...so we were talking about late blooming plants. Meet the "century plant"....the curator told me that it takes 35 years to bloom - but ancient people thought that it takes 100 years. Unlike titan arum, the flowers are filled with sweet edible honey. Note the height of the stalk. Here in Risalpur....quite a few century plants are/were in bloom recently......Don't know the blooming period but blooms does last for months. and the real strange thing is the size of the bloom in comparison to the plant itself as you mentioned. You are absolutely correct. This is exactly what I found out when I was reading about this intriguing plant. Every living thing whether beautiful or ugly is a creation of Allah and accordingly deserves to be appreciated as such. farhan137 wrote: Here in Risalpur....quite a few century plants are/were in bloom recently......Don't know the blooming period but blooms does last for months. Talking of century plnts, I quote: "The misnamed century plant typically lives only 10 to 30 years. It has a spreading rosette (about 4 m (13 ft) wide) of gray-green leaves up to 2 m (6.6 ft) long, each with a spiny margin and a heavy spike at the tip that can pierce to the bone." " Plants only flower when sufficiently large, usually about 30-40 years old, after which the main plant dies, leaving young offsets as successors. " "Agave americana (American century plant) – also known as Maguey – and many other agaves only bloom after years of maturing, and die after the bloom is spent. The plant life span is variable; its bloom triggering process is not yet understood. Ten years is reported to be a typical age for the bloom to occur, but it can be many more. While the original plant dies, it has usually left a number of offshoots, "pups", at the base which repeat the growth cycle and mature into next generation plants. Left untended, the plant can multiply and spread vigorously." Come to think of it I have a couple of plants resembling the picture shown on the BBC Site. I plan to post their picture, Fellow Members especially Mr. Tahir Khan will surely be able to identify it. Another plant with same characteristics as Titan Arum, but it’s not as big as Titan also better in looks and it can be tried in a normal pot, not so expensive and easily available with some vendors. but it require a lot of courage to try this plant especially because of its smell that I think I may have or may haven't, if I consider its flower I don't mind but smell ooo.......mmmmmm...not sure. 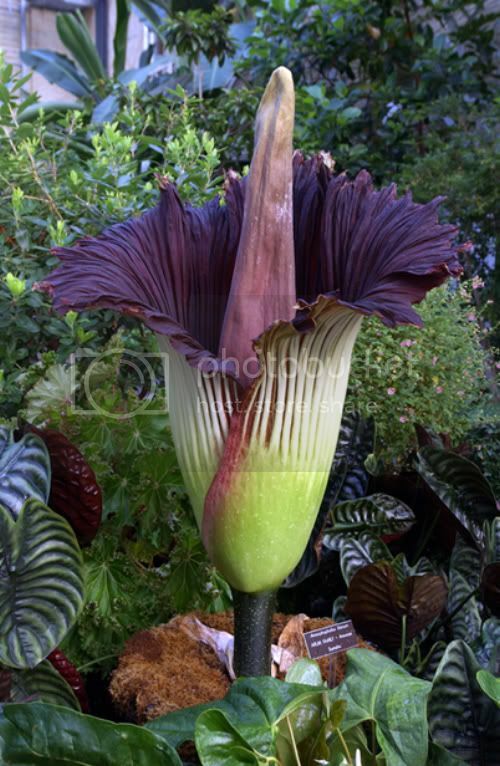 Hamad wrote: Another plant with same characteristics as Titan Arum, but it’s not as big as Titan also better in looks and it can be tried in a normal pot, not so expensive and easily available with some vendors. but it require a lot of courage to try this plant especially because of its smell ;) ;) ;) that I think I may have or may haven't, if I consider its flower I don't mind but smell ooo.......mmmmmm...not sure. When I read the name of your plant in the picture as Dracunculus vulgaris , my first thought was that it is derived from Dracula- from its blood red colour and severe stench :-). However the literal meaning its name turned out to be so innocent : "Common dragon"